Grab and go breakfast that tastes like dessert? Yes, please! 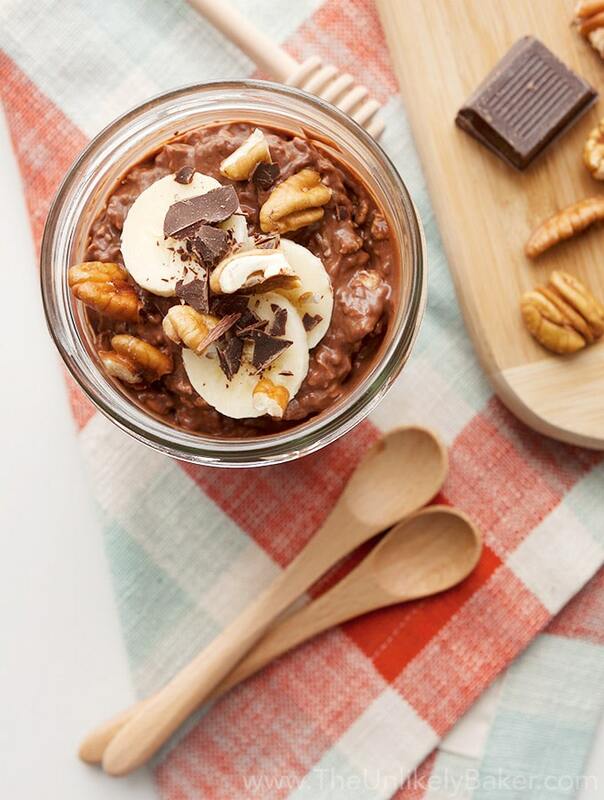 Chocolate peanut butter overnight oats is a great way to start the day. (Fan of overnight oats? Check out these other delicious recipes: Raspberry White Chocolate Overnight Oats and Matcha Overnight Oats). #Choctoberfest continues on The Unlikely Baker with chocolate peanut butter overnight oats. It’s packed with dark chocolate, peanut butter, chia seeds and other ingredients that are not only delicious but also good for you! BTW did you see my recipe last Wednesday? It’s a lovely Chocolate Chiffon Cake with Whipped Cream Frosting. Perfect for the holidays! And have you entered our #Choctoberfest lucky draw yet? You can win a prize pack worth $450! It would be amazing if a TUB reader won. Click here to enter (hurry it ends soon!) then on to delicious overnight oats we go! We’ve been eating overnight oats almost everyday for I don’t remember how long now and I can’t bring myself to eat old school oatmeal anymore. Overnight oats are delicious! And so easy to make. and not quick cooking oats. The latter tends to get too mushy when left soaking for too long. : they absorb a lot of liquid. 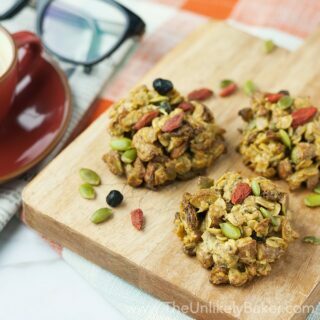 Speaking of favourite things – if you’re adding nuts (or anything else that’s crunchy, like granola), add them just before you eat the oats so they don’t get all soggy and sad. Always add a pinch of salt. It’s a little thing but it goes a long way to enhance the flavour. Chocolate and peanut butter is a classic combination and is one of our favourite overnight oat flavours. How can it not be? With chocolate, peanut butter and almonds, it tastes like dessert and that’s always a good thing in the morning IMO! We usually make 2 batches on Sunday and we’re set for the week. So this weekend, make some chocolate peanut butter overnight oats and wake up to delicious, chocolatey goodness on Monday morning. In a large bowl, stir all ingredients (except honey) until combined. Add honey to taste. Transfer the oats into individual airtight containers and chill overnight. You can transfer the oats to a bowl and garnish with your favourite toppings or eat directly from the container! Some of our favourite toppings include: chocolate chunks, almonds, pecans and banana. 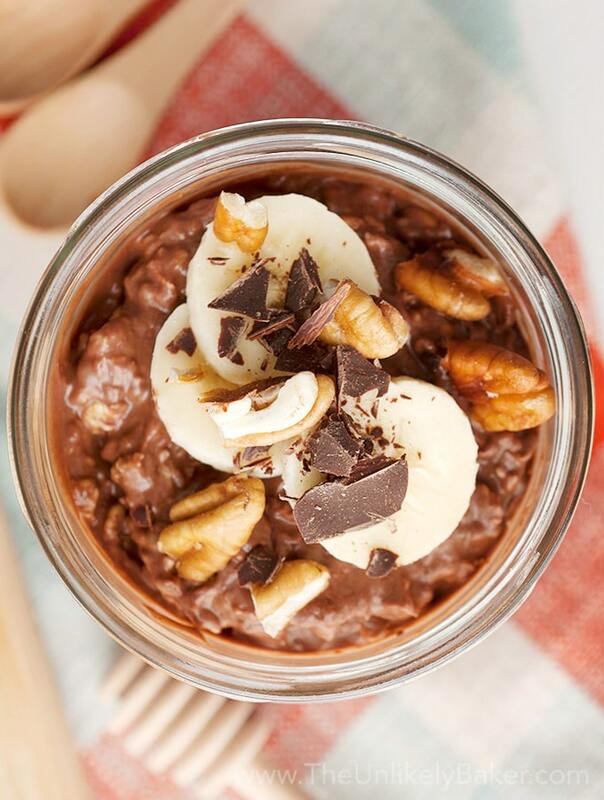 Did you make chocolate peanut butter overnight oats? I’d love to hear from you in the comments section below. And check out these other recipes for #Choctoberfest! I’ll give it a try for the family, I know they’ll love it! thanks! 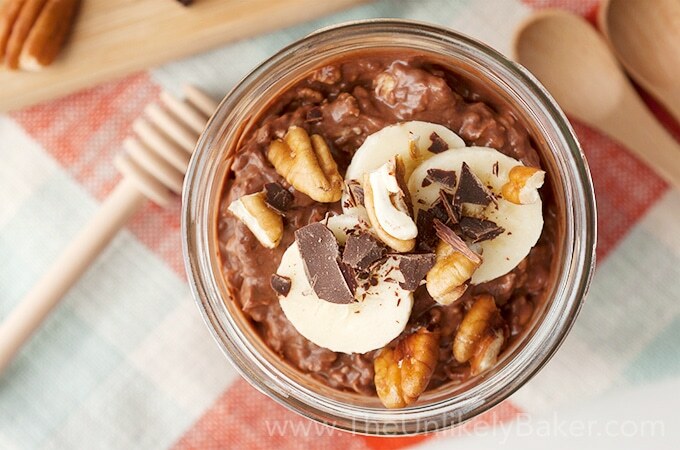 This chocolate peanut butter overnight oats looks so delicious. I really love oatmeal and this is such a great idea. I will definitely check and try this one. I have a sweet tooth. 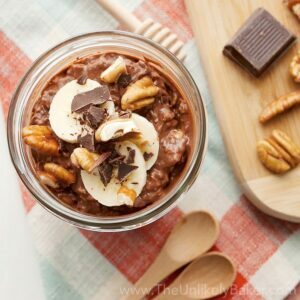 These Chocolate Peanut Butter Overnight Oats look so tasty. This seems like a great midday snack. I think I”m going to replace the peanut butter with almond butter and give it a go. Almond butter would be delicious! A great grab and go breakfast! Thanks for sharing another overnight oats recipe. I am a huge fan of overnight oats. This is one amazing combination. This sounds wonderful and it looks fairly easy to make. And your chocolate chiffon cake sounds like heaven. It does not get much better than chocolate and peanut butter. This overnight oats recipe sounds delicious! i love overnight oats! this looks amazing! Wow this looks incredible! 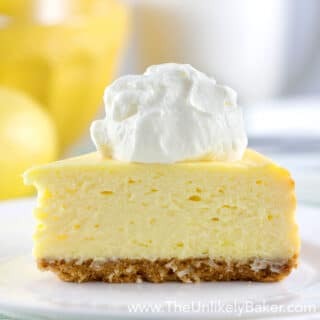 I love all the ingredients so I can’t go wrong trying to make this! I don’t like peanut butter, but my boys love it! 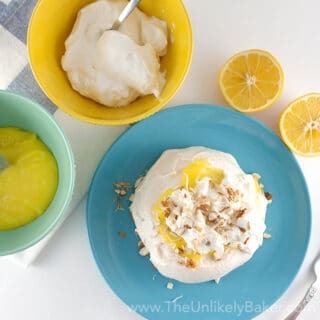 I have been trying to find new breakfast ideas, I’ll have to make this for them! These chocolate peanut butter oats look delicious and really tempting. I really like oatmeal, especially in the morning. I will definitely give it a try and add some twist. Oh wow, this looks like heaven! This is the best overnight oats I’ve ever heard of! Definitely making this. Thanks for the recipe! 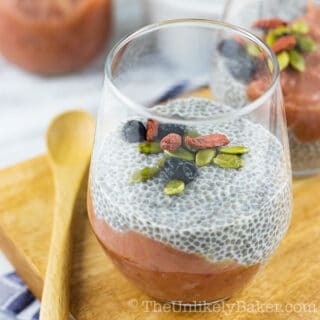 Yummy idea for a quick easy breakfast that way you do not skip it thanks for the tips on how to make overnight oats. Mmm, a delicious recipe with my fave combinations of chocolate and peanut butter. Two worlds that melt into one. Chocolate and peanut butter go together perfectly! 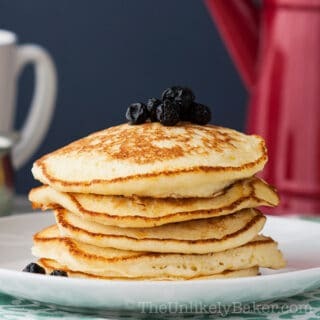 What a delicous and healthy and quick breakfast idea! Yummers! We eat oatmeal often. My kids like peanut butter and chocolate so I know this would be a hit. I don’t usually make overnight with much success so I’ll give it another try. These look super yummy. I believe I have everything needed to make these too. Guess who’s getting a new treat this weekend? This gal! Haha. I seriously am happy you shared this! Ooh! 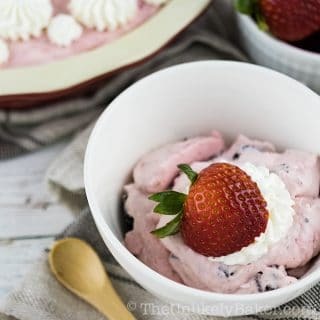 This would make a yummy dessert, too! Yeah – I’m kinda nuts like that. I LOVE chocolate and peanut butter together, and also love oatmeal — this looks delicious! Oatmeal has never sounded so good! I haven’t tried overnight oats, but my sister swears by them. This is one that I need to try. My husband is super into overnight oats right now so I will send him this one. I bet he will love it! This recipe is recipe is right up my alley. Peanut butter and chocolate are some of my favorite things. I’m going to add it to my oats.